Each year we plan a safe FULL riding schedule including ice cream and supper rides , charity rides , and rallies . o ….. And MANY, MANY MORE EVENTS …..
meeting, chosen by the membership at the prior meeting that month. From November through April , chapter meetings are held on the first Monday of each month . Chapter meetings are not mandatory to participate in our chapter, but we welcome and encourage member participation by sharing new ideas that pertain to the chapter , as well as suggestions for new rides and adventures . Minuteman Harley Davidson . It also allows you to attend events only available to chapter members . So you want to join. That’s great!!! The process is very simple. First, you must be a member in good standing of National HOG. Once we receive and verify your application, we will add you to our membership roster. It’s that simple. 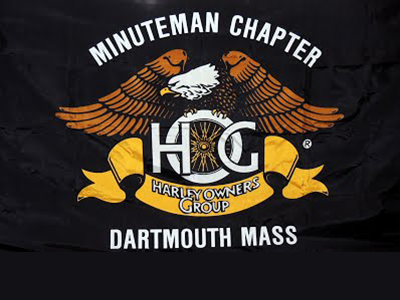 You will be entitled to all the benefits associated with being a Minuteman HOG member. Fill out the form and send it to us with a check for the correct amount of dues as above.